Whether you find ticks in the house or out back, use this game plan to reduce your health risk and prevent an infestation on your property. Q: Just yesterday I spotted a tick on my bathroom floor and last week I found one on my clothing. Is it possible that I have a tick infestation in my house? Or, maybe in my yard? I know tick bites are related to Lyme disease, so I’m eager to find the best way to keep them out. A: One tick in the house is one too many. While it’s unlikely that you have a tick infestation inside your home, there’s a good chance that you’ve got some living nearby outdoors. Of the 90 species of ticks that exist in the United States, only a handful carry diseases; the Centers for Disease Control and Prevention (CDC) provides online maps that show the geographical distribution of the different disease-carrying ticks, so you can see which ticks are a health threat in your area. 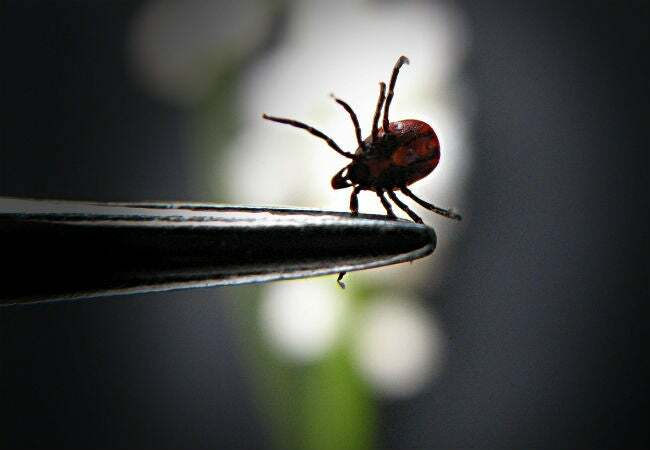 Because these pests can carry Lyme disease—a tick-borne disorder that has seen a recent surge in the Northwest—among other diseases, it’s always a good idea to protect your family and your pets when you know that ticks are in the vicinity. To find out what to do when you find a tick—inside or out—keep reading. We’ll let you know how to reduce your risk of exposure and how to treat your house and yard to ensure that ticks won’t set up shop. If you do find ticks in the house, don’t bother stepping on them. A tick’s body is very hard and—despite your best efforts—it could survive. A better option is to pick it up with a piece of toilet paper and flush it down the commode. This is also the best way to dispose of ticks that are crawling on your body. If you find one biting you, however, use a pair of tweezers to grab it and pull it off, then flush it. Tick infestations are rare indoors, though it never hurts to take precautions. 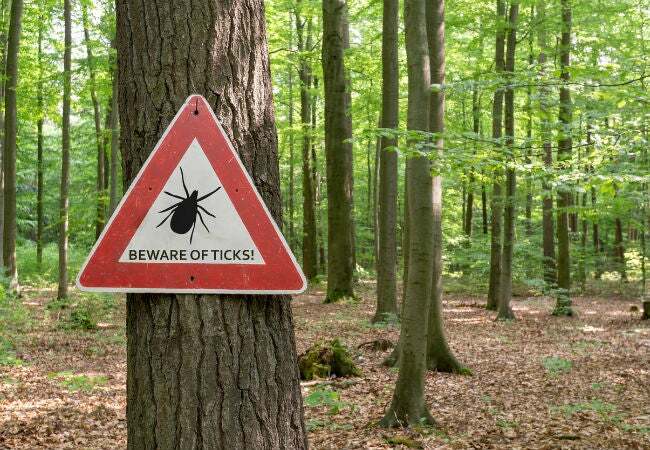 Ticks thrive in moist and humid conditions where the humidity is 90 percent or higher, and most cannot survive in a climate-controlled house for more than a few days. Indoors, they simply desiccate (dry out) and die. In fact, the University of Rhode Island’s Tick Encounter Resource Center (TERC) reports the results of a study where immature deer ticks that were exposed to indoor humidity levels of 75 percent died in about eight hours. While a tick might live a couple of days in a hamper with moist clothing, it won’t be long enough to reproduce. In rustic vacation cabins, storage sheds, or doghouses, however, it’s a different story. These structures—because they are not air-conditioned (which removes humidity from the air)—could potentially offer the right environment for ticks to breed. Fortunately, ticks are fairly easy to kill. You can use a non-toxic pesticide that’s safe for indoor use, such as Wondercide Flea and Tick Spray (available from Amazon). Spray liberally along baseboards and moldings, under cabinets, in corners, and on windowsills to kill all ticks. A completely natural alternative treatment is to sprinkle diatomaceous earth (DE) in the above areas and even on carpets and pet bedding. Diatomaceous earth isn’t earth at all but rather the finely ground exoskeletons of fossilized sea organisms. When ticks come into contact with DE powder, it acts as a desiccant (drying agent) to dehydrate the ticks. Make sure to buy food-grade DE (yes, people may actually consume it). You can fill a talcum powder container with DE and sprinkle it on floors and in sheds and doghouses. You can also sprinkle it on carpeting and then use a broom to brush it in so it’s not noticeable—it’ll kill any ticks that might be crawling at the bottom of the carpet pile. Fear not, DE is harmless to animals and people. • Trim overgrown shrubs to allow light and air to circulate beneath their boughs; this will reduce the dampness of the ground beneath. • Restack wood piles in a dry spot, such as on top of used wood crates to allow air to circulate beneath. • Treat stacked stone walls by inserting tick-killing tubes such as Thermacell Tick Control Tubes (available from Amazon) into the gaps between the stones. The tubes contain permethrin, which kills ticks on contact. For safe use, follow manufacturer directions to the letter. • Place tick tubes in the corners of storage sheds, too, or sprinkle diatomaceous earth on the floor and in corners. 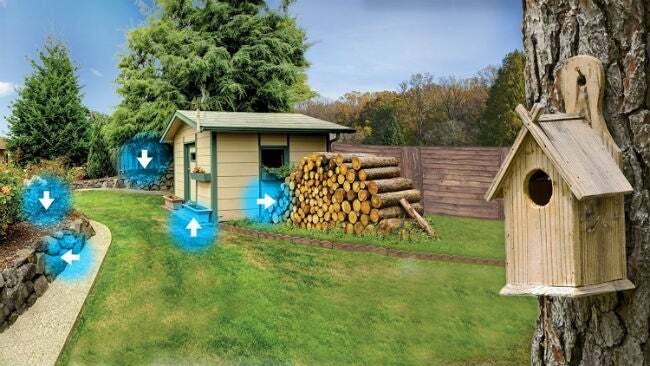 You can also scatter DE along the outside perimeter of the shed, but water destroys the powder’s effectiveness. If it rains, you’ll have to reapply DE. • Remove leaf piles after raking. • Mow frequently to keep lawn grasses low, which will reduce moisture at ground level. Curtailing tall grasses (as well as treating woodpiles and other high-risk tick spots) cuts back places that are attractive to ticks as well as to your furry friends. This is especially important because, if you have pets that go outside and come back in, there’s a good chance they’re the ones bringing ticks into the house. Ticks sense when a warm body is in the vicinity, and they head straight for it; once burrowed beneath your pet’s fur, ticks can be hard to spot. Tick bites can transfer diseases to your animals, so it’s a good idea to protect them from ticks if you let them go outside. A variety of tick-repellant shampoos are available for dogs, but don’t use them on cats that can be sensitive to the ingredients, unless directed to do so by your vet. Topical tick repellants and medications that are taken orally are also available to treat your pets, so check in with the veterinarian for the most effective options. Even with treatment, though, which will protect your pet from bites, ticks can still hitch a ride indoors on thick fur and then crawl off on the carpeting. If your pets continue to bring ticks into the house, it’s a good idea to treat the house using treatments to speed up the elimination of ticks, such as sprinkling DE around. Apply a tick repellent to yourself before heading outside to reduce the risk of bringing ticks back on your clothing. Not all insect repellents will keep ticks away; some are effective only for repelling mosquitos. The Environmental Protection Agency (EPA) offers an interactive site where you can get recommendations for repellants based on the insect you’d like to repel and how long you’ll be outdoors. One such repellent that protects against ticks and smells good while doing it is Avon’s Skin So Soft Bug Guard (available on Amazon). A word of caution: If you have a newborn in the house, be aware that the EPA warns against using insect repellents on infants younger than 2 months old.